The Russian superstar Ian Nepomniachtchi is knocking on the door of the elite players in the world. Currently rated right inside of the top 30 players in the world, he has had great success in tournaments and did it in a fairly short amount of time. Having been born in the same year as elite super-GMs such as Magnus Carlsen and Sergey Karjakin, Nepomniachtchi unfortunately has yet to reach their caliber of play and rating. He is playing in a lot of tournaments though and hopes to soon be mentioned among them as a comparable player. Ian Nepomniachtchi was born in Russia and learned to play chess at the age of 4. He quickly won many chess achievements and tournaments, becoming the European U10 champion in 2000, European U12 champion in 2001 and 2002 and World U12 champion in 2002. A few years after these youth accomplishments, Nepomniachtchi he became an International Master in 2004 then a Grandmaster in 2007. This preceded a period of time where he won a few big tournaments. This includes the World Youth Stars in 2007 and the Aeroflot Open in 2008. Since then he has placed well in many tournaments including three tournaments in one year: the 2010 European Individual Championship, Capablanca Memorial (where he broke through the 2700 rating barrier for the first time) and Russian Championship. Aside from his strength at the classical time controls, Nepomniachtchi is also a great rapid player, having great success in tournaments such as the 2008 Ordix Open, 2009 Chess Classic Mainz, 2013 FIDE World Rapid Championship and 2013 FIDE World Blitz Championship. 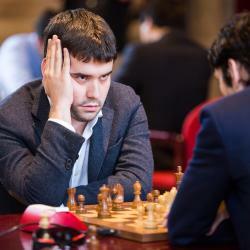 Another note is that he is one of Magnus Carlsen’s seconds who helps him prepare for tournaments. He is a terrific player who has a little bit more to go before he is talked about being one of the very best in the world, currently being ranked right inside the top 30.